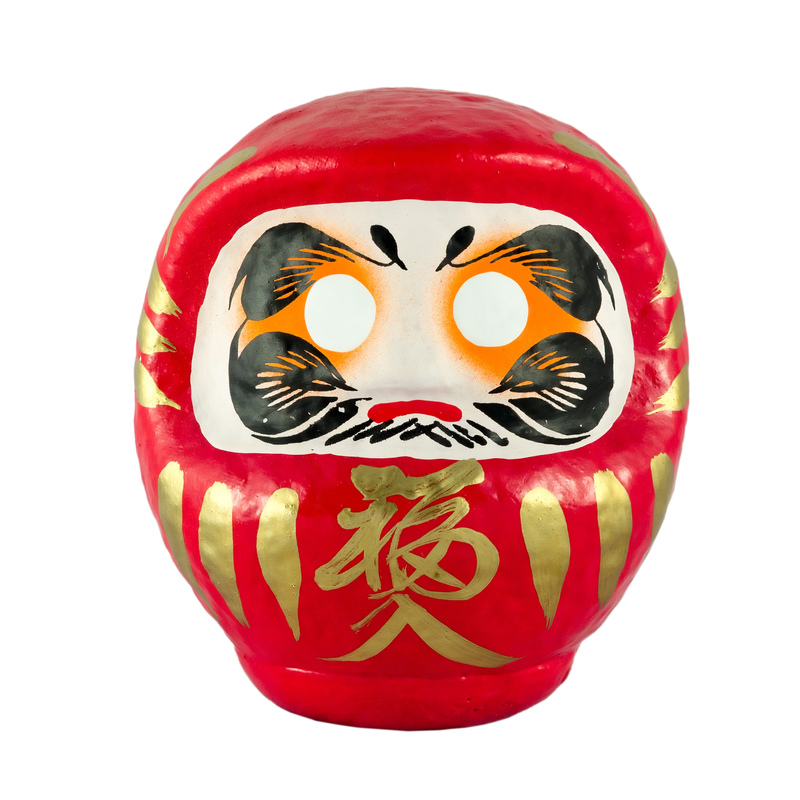 Have you seen a Japanese daruma doll before? I’m obsessed with them, and guilty of having quite a few nestled here and there in my apartment. When you first become the proud owner of a daruma, you fill in one of its eyes and set a goal for yourself. When the goal or wish is fulfilled, you fill in the second eye. You’ll be motivated to make that wish come true, if only so that the little guy can see again! This is a three layer tahini cake with tart citrus curd. Tahini, made from toasted ground sesame seeds, has a mild, nutty taste which is a dream pairing with the tangy mingling of lemon and grapefruit flavors. Add a cloak of tahini cream cheese frosting, and this cake makes wishes come true. As someone who likes their cake not on the supersweet side of the spectrum, this was the ideal treat for me. To create the daruma design, I used strawberries, chocolate shortbread cookies, and edible copper glitter. This cake is ideal for serving at any occasion… it signifies the mouthwatering beginning of a new wish or goal. It’s perfect for the new year, a wedding, or really any new phase of life that you want to celebrate. What better time for an uplifting baking project than the beginning of 2018? Preheat oven to 350 degrees. Line two 6 inch cake pans with parchment and nonstick cooking oil and set aside. In a large bowl, whisk together the sugar, flour, cinnamon, baking soda, baking powder, and salt. In a separate bowl, mix the eggs, buttermilk, oil, tahini, vanilla extract, and water. Whisk the wet ingredients into the dry ingredients until well-combined. Pour batter into prepared cake pan and bake until a toothpick inserted into the center comes out clean. Begin checking the cake after 30 minutes. Let cakes cool. Torte both cakes into two separate discs. Use to make a three or four layer cake. Combine the grapefruit and lemon juices in a saucepan. Simmer until reduced by about half, about 15 minutes. Transfer to a different container, add the grapefruit zest and let the juice cool for about 30 minutes. In the same saucepan, whisk together sugar, egg yolks, and whole egg. Add the citrus juice and whisk again to combine. Place the pan over a double boiler and cook, whisking frequently until the mixture thickens and a few large bubbles break the surface. Immediately remove from heat, add butter, and stir until melted. Strain the curd through a fine mesh sieve, transfer to an airtight container and refrigerate until completely chilled, about 2 hours. When assembling the cake, use a piping bag to distribute between layers. Cream together the butter and cream cheese in a stand mixer until combined. Mix in the powdered sugar, salt, tahini, and vanilla. Beat until light and fluffy.